I finally fell prey to the most talked about kitchen gadget today: the Instant Pot. God knows that I don’t need any more kitchen-anything, but I received a Williams-Sonoma gift certificate for my birthday and there was nothing else I wanted to spend it on other than something I was curious about but did not want to pay for with my own money. Game over. This recipe is from Melissa Clark’s Dinner in an Instant with some of my adjustments. I didn’t want to buy coconut oil, so I skipped that here. I also didn’t get enough tomato pulp after grating 3 large ones and that resulted in the “burn” display on the pot. I had to add some broth to liquify it so I have substituted chopped tomatoes for you to avoid making the same mistake. For my first Instant Pot experience, I would give it high marks. I timed my entire process and I was “cooking” for exactly an hour. Now, you still have to use some cooking chops and common sense to repair a dish that burns; no gadget can tell you that because that’s all instinct you learn from years of cooking the basics. You still have to chop your ingredients and sauté aromatics. 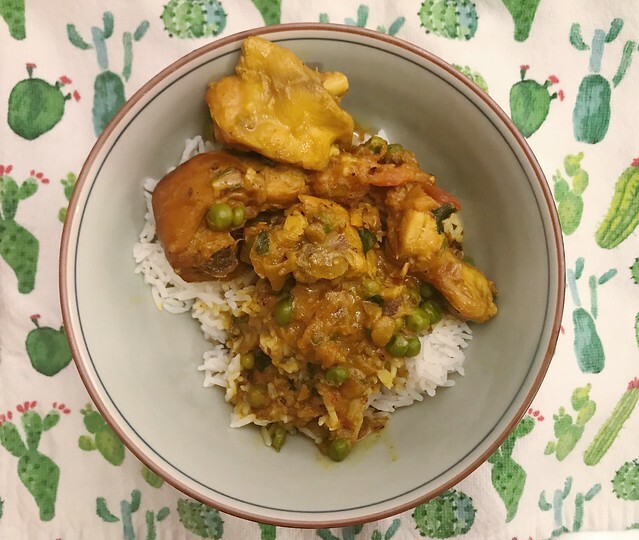 What the Instant Pot did for me is cook the chicken in the shortest time possible without the scary whistling sound that I grew up with in my parents’ kitchen. It was quiet and smooth-sailing after I went through the Getting Started tips recommended in the manual. I would have made this dish stove-top any other day, but it would have taken an extra hour to simmer and make sure the chicken pieces were cooked through. The Instant Pot did not sacrifice the depth of flavor, one important thing that I don’t like about regular slow cookers. The stewing broth that came out in the end was just as flavorful as if I braised it in my Dutch oven. 1. Using the sauté function of your Instant Pot, heat the ghee. Stir in the onions and cook until they are caramelized, about 12 minutes. Stir in the garlic, ginger, and cumin seeds for 2 minutes. Stir in the cinnamon and cardamom and cook for another minute. Then add the coriander, turmeric, curry powder, and red pepper flakes. Add the chopped tomatoes and season with salt and pepper. 2. Add the chicken pieces to the sauce, and then cover and lock the lid properly. Select the Pressure Cook function for 4 minutes. When it’s done, do a quick release after venting and letting the steam out. 3. Select the sauté function again and stir in the coconut milk, just enough for the consistency that you want. You don’t want the sauce to be too thick, nor for it to be too soupy. Add the green peas and the cilantro for color and keep stirring for another 2 minutes until the peas are warm and for the flavors to meld. Serve with rice.